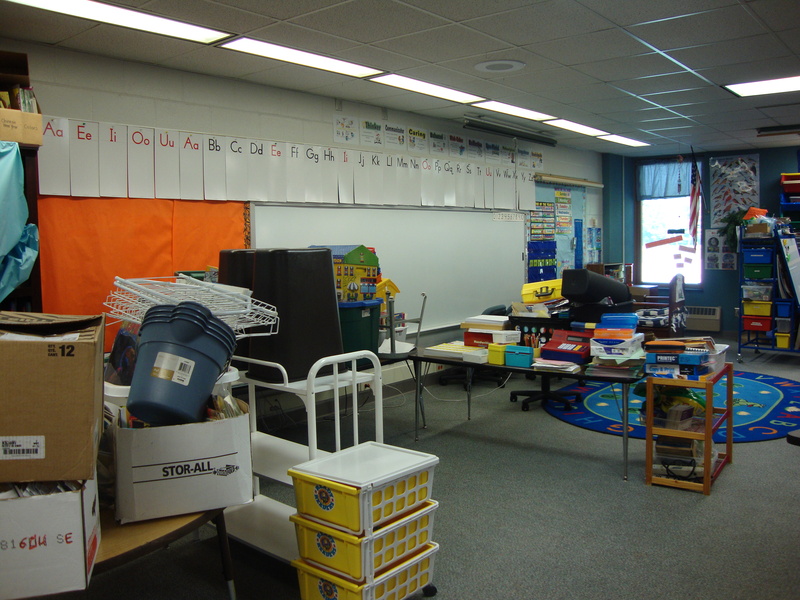 I was hard at work at school today arranging my classroom in a new, totally different way. After re-reading Literacy Work Stations, some changes were needed and the most important thing I did today was add a Science Work Station. Can you believe it?? Me, All things Science Girl, did NOT have a proper Science center! Done! 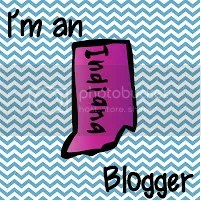 I do now!! 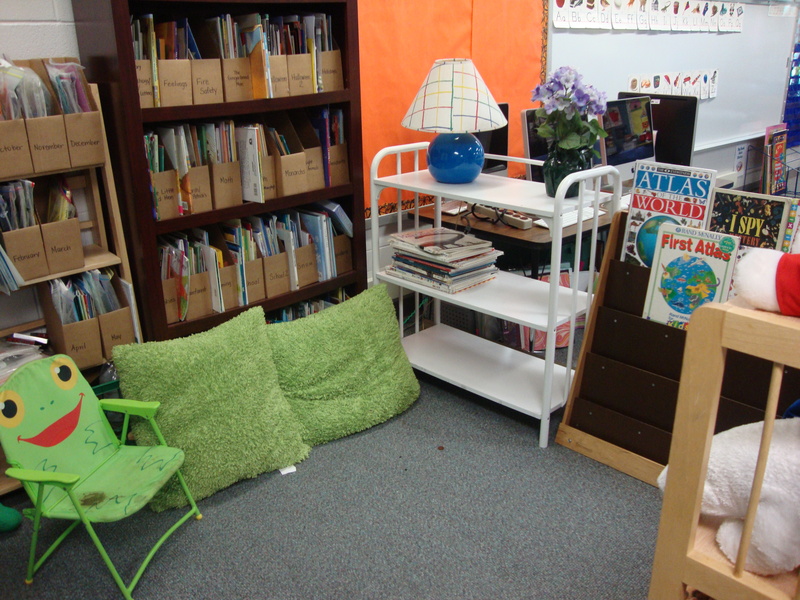 Here you see my mailboxes (far right) and the kids tables that I moved closer to the carpet. 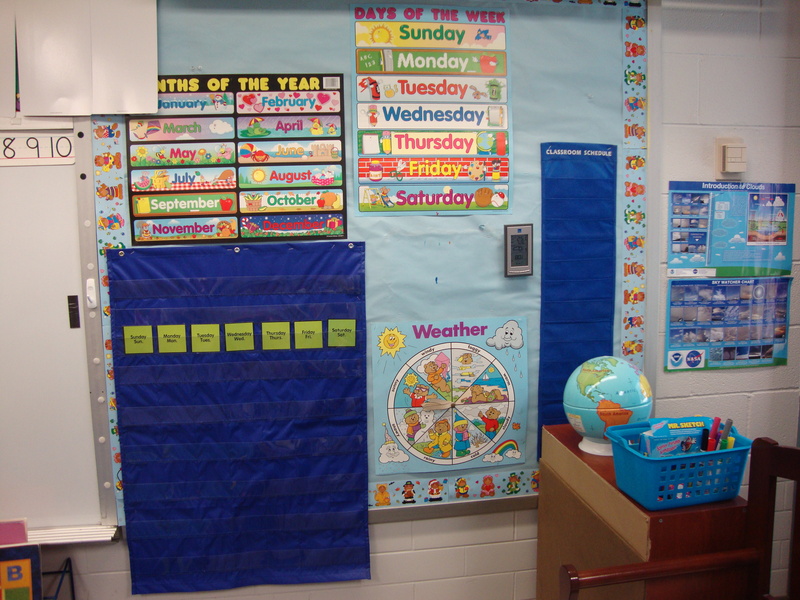 My drama station will be on the closed door next to the blue cabinets. I will hang the drama props in bags that I got from the dollar spot at target. I will put one or two books out with the props in the bags and hang them on the wall with hooks. I think that will help get the props back into the right spots and with the right books. I’ll take pictures once I get that more established. 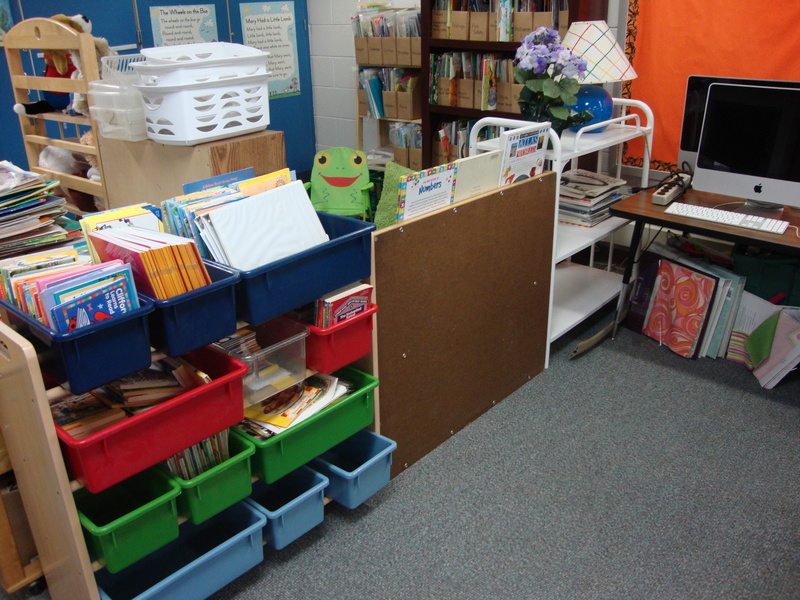 The table that you see will house my “Social Studies Work Station”–still in progress! This is a better view of where the kids tables are. I have six of them, five rectangles and one circle. I moved my horseshoe table under the television so that I can use it for small groups. I’m starting my grad classes later in August and will need this table for many of my “projects”. My degree will be an M.A.E in Elementary Education with a Reading Focus. Here is a long shot of the room. It looks so open here! And narrow too! I pushed the tables all over to the right side and saved the left side for our whole group area, writing, computer, science, library, and listening work stations. In the very front of this picture you can see my sand table (piled high with big books because the tub I had them in busted into 12 pieces when I moved it off the table). You also see the back of a tall and short bookcase which serves as a wall to my library work station. It used to be back in the corner by the window you see. 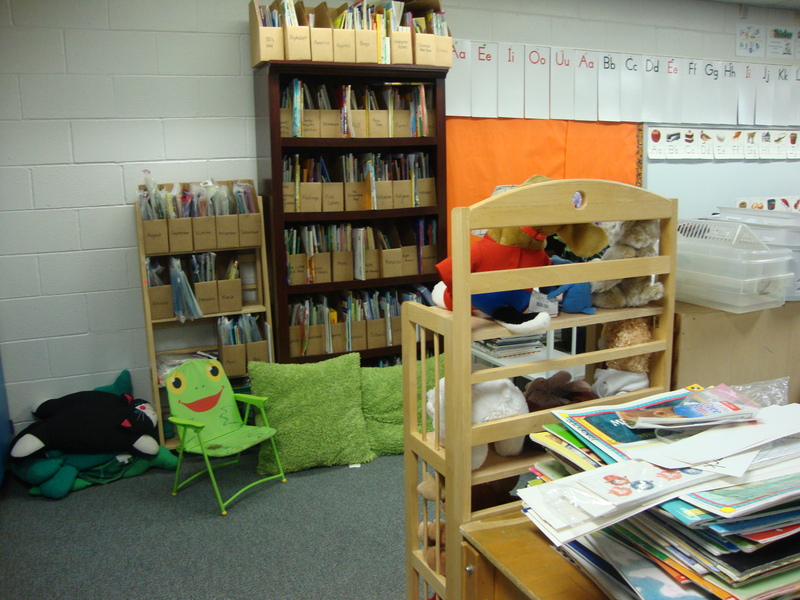 Here is another look at part of the library. The books you see in magazine holders are my read aloud collection that I sorted out last year. I wrote a grant to get the bookshelf and the magazine holders in January. This is another look at my new library work station. And another view. I will be putting black baskets on a few of the shelves and after I label the books, they will go in the baskets. I’ll do that tomorrow. 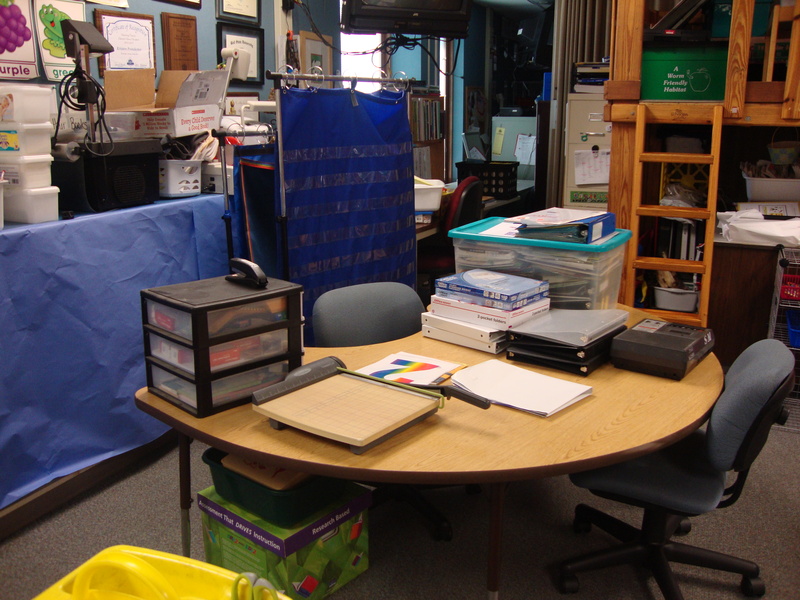 This is a picture of the backside of the library work station. 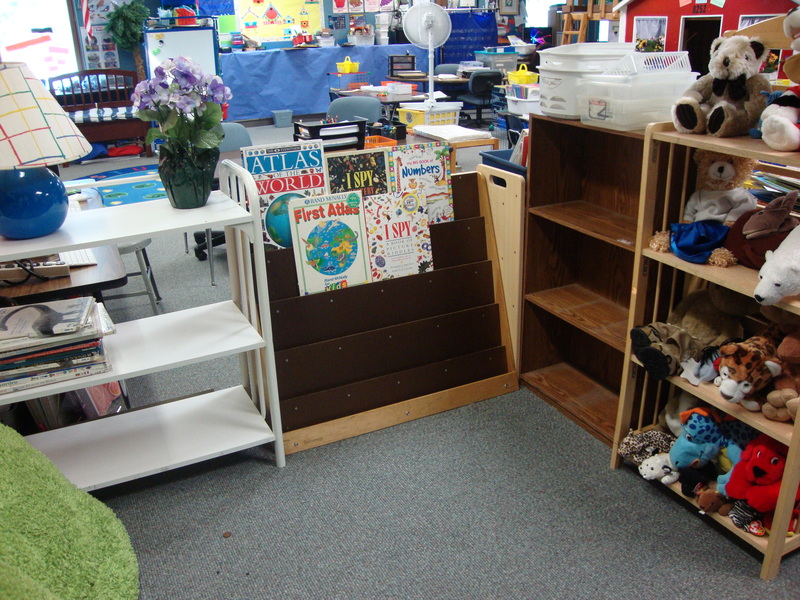 The back of the book shelf you see (smooth, brown) will have small pocket charts hanging from it for the Word Study Work Station. You can also see the blue, red, and green shelves that house my baggie book collection. The table you see to the right is my new Writing Work Station. I used to have a writing desk there with cubbies, but decided I needed to create one to suit my needs. I’ll be making a table skirt for both of these tables and my science table with fabric I got at Wal-Mart (5 yards for 5 bucks). I spent $20 and got 20 yards of fabric that will be more than enough to cover all three tables. 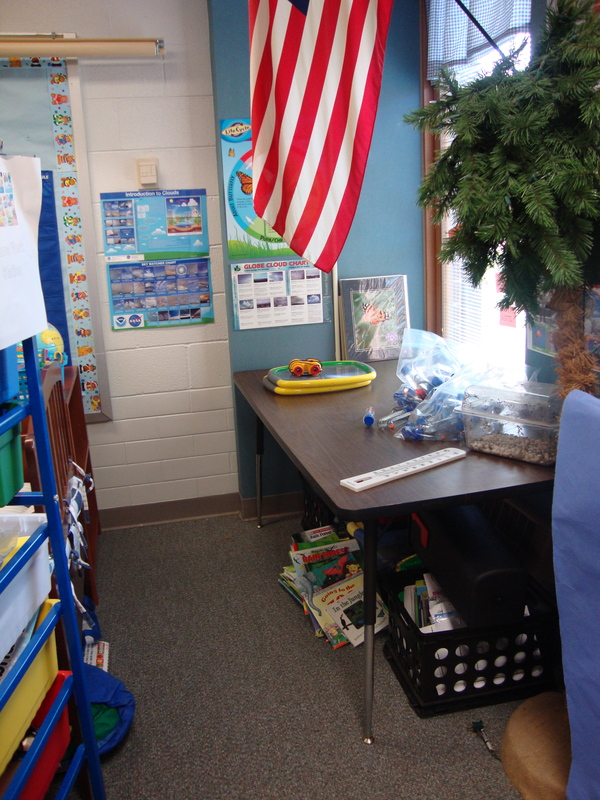 Here is another look at the Writing Work Station. 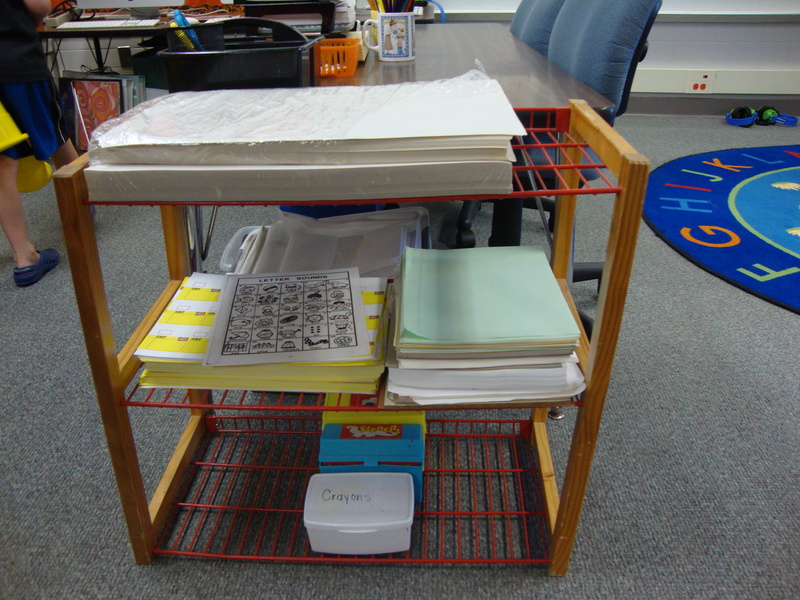 This is a shelf that holds more materials for the Writing Work Station. 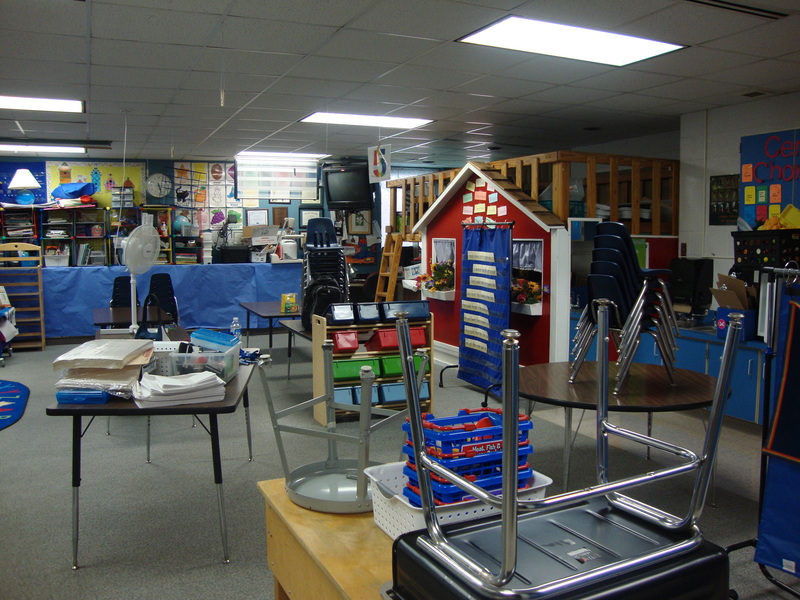 This is a picture of our large group space. This is my new Science area. Looking un-finished still, but I need to figure out what to put here first! I’m going to make a skirt for this table as well. 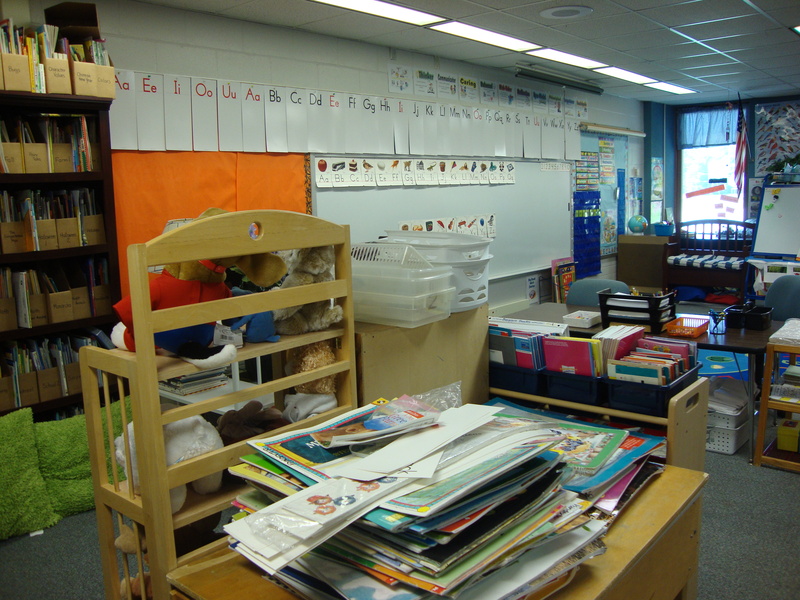 Here is my small group teaching area, covered in all the back to school goodness of paper work and binders! Here is another view of the room from the opposite end of the door. One last view. I’m going back in tomorrow to work on it some more, but this will be the basic layout this year. 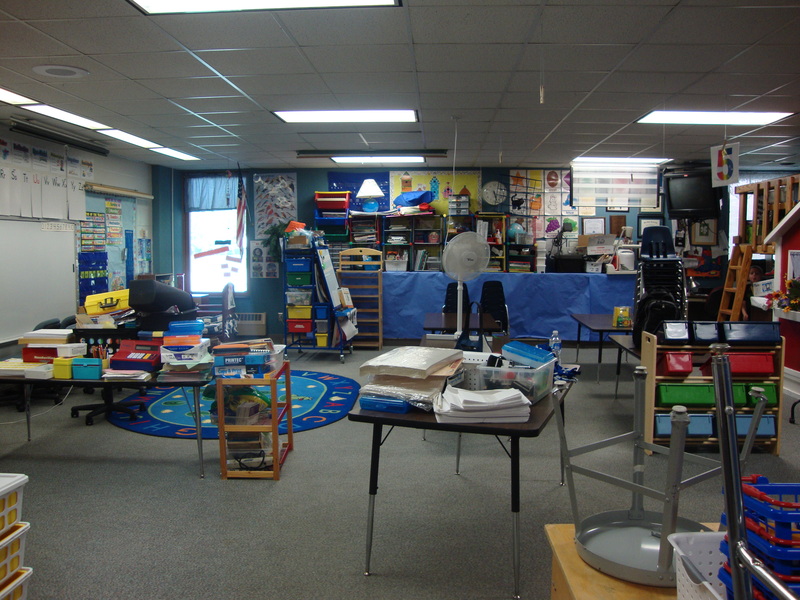 Posted on July 27, 2010, in 2010-2011 Classroom Pictures, Binders, Classroom layout, DonorsChoose.org, Kindergarten Classroom Layout, Kindergarten classrooms, Literacy Work Stations. Bookmark the permalink. 10 Comments. That big red house face looking thing…..is that your housekeeping area?? That is so awesome!! Did someone build that for you?? 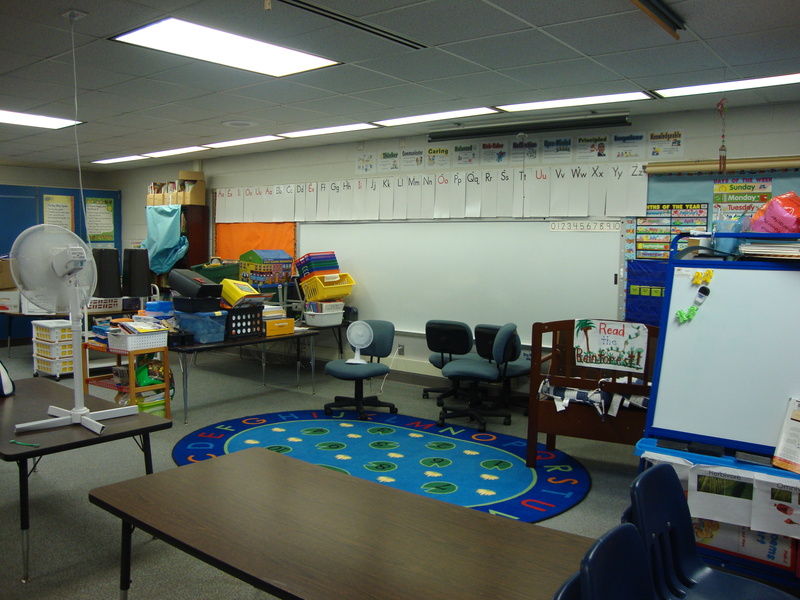 I really want to come see your classroom……you have some great ideas! 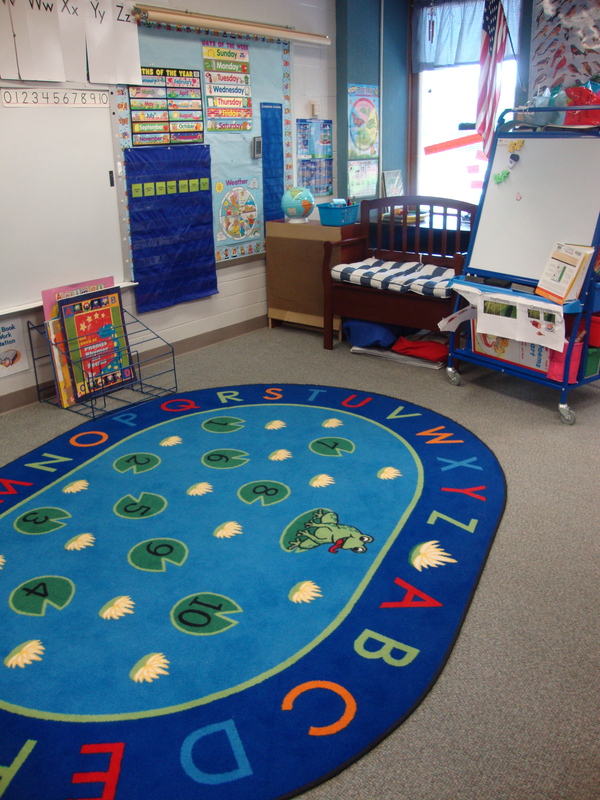 Do you have a specific math station also? 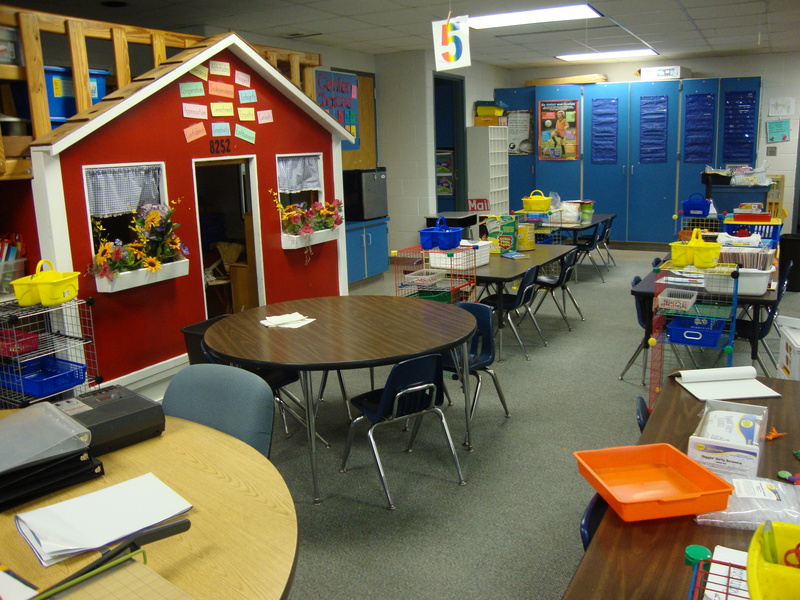 I’m not sure exactly how many square feet my classroom is, but I would guess between 700 and 800 square feet. 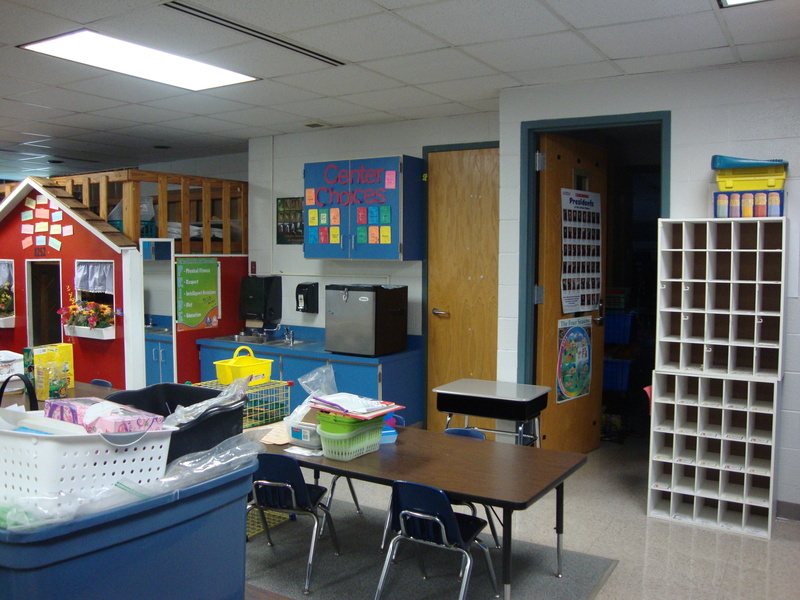 I love your classroom and all your ideas! Thank you for taking the time to share! 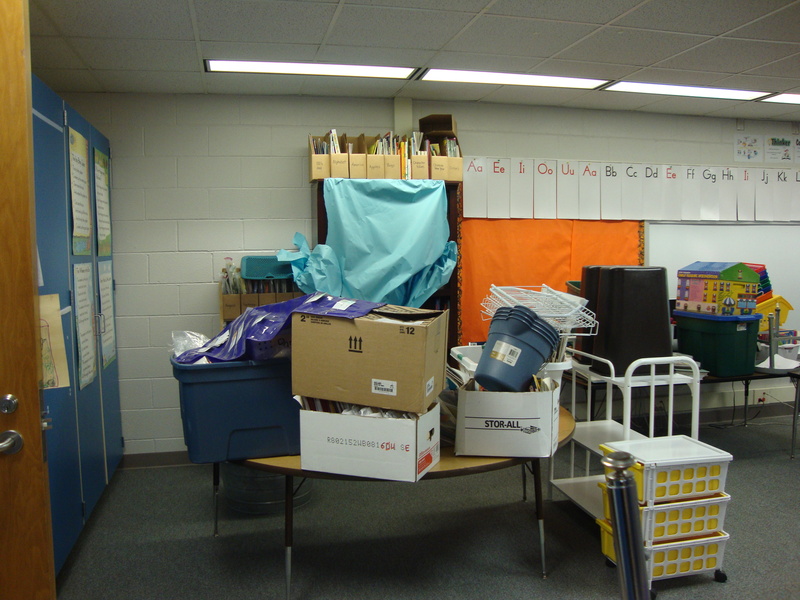 I can’t wait to see your classroom when it is finished! Have fun finishing the room. You inspired me to start a science center this year. I bought my first item today at a garage sale! Thanks for the inspiration! 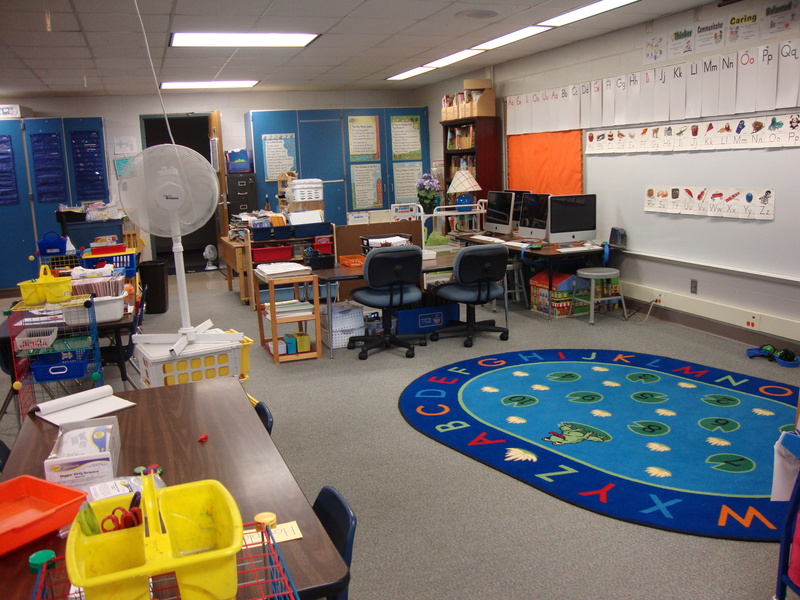 Hello Kristen, I am a kindergarten teacher and I am looking for a new look in my classroom this year. I love the way that you arranged the room. 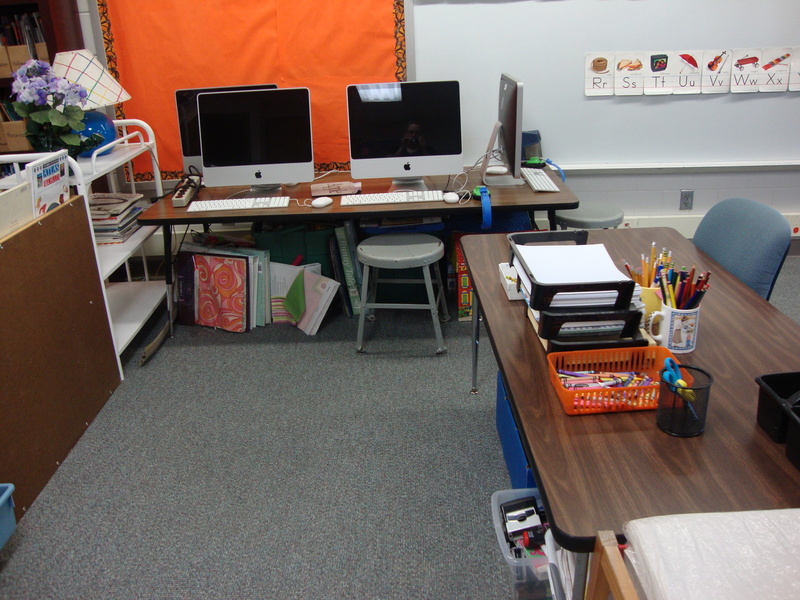 I have desks, not tables- do you have a suggestion for how I can change the way I set up my desks? 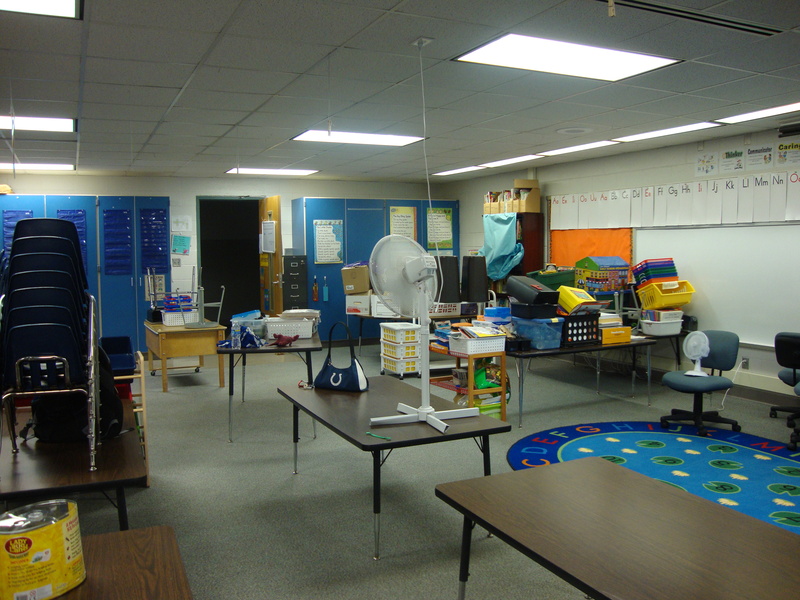 I usually put the students in a group of four desks (like a table) and I have 20 children. I am looking forward to seeing the finished product of your room. There are many days when I wish I had desks! 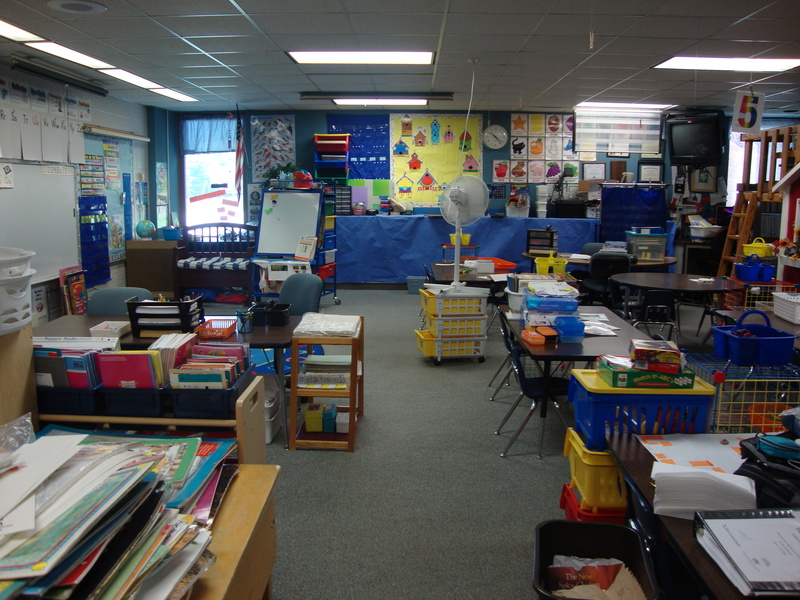 Each child could have their own work space and know their bounds. 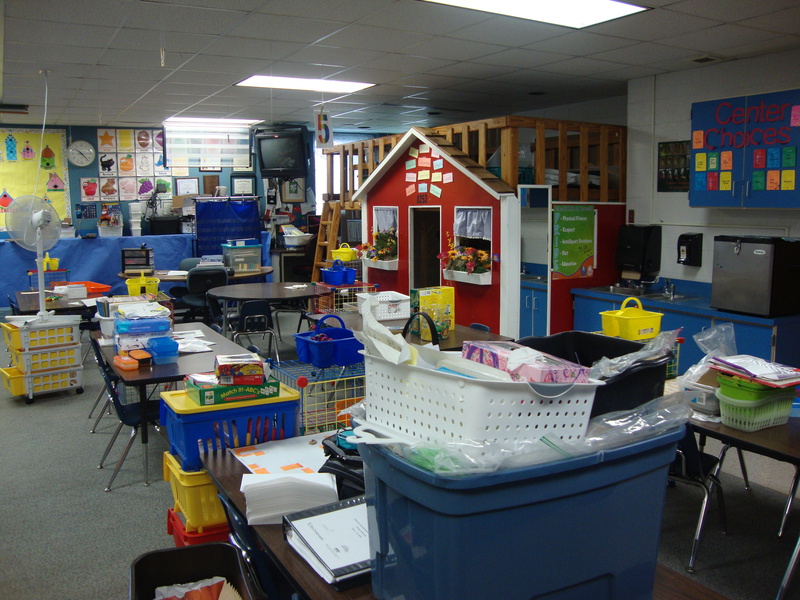 I’ve never had desks, but if I did, I would set up four desks clustered around one or two extras in the middle where the children could store common supplies and where you could store some extra materials under those middle desks. I’ve seen teachers put caddies (to hold scissors, crayons, glue, pencils, etc.) in the middle and then the children share those materials. 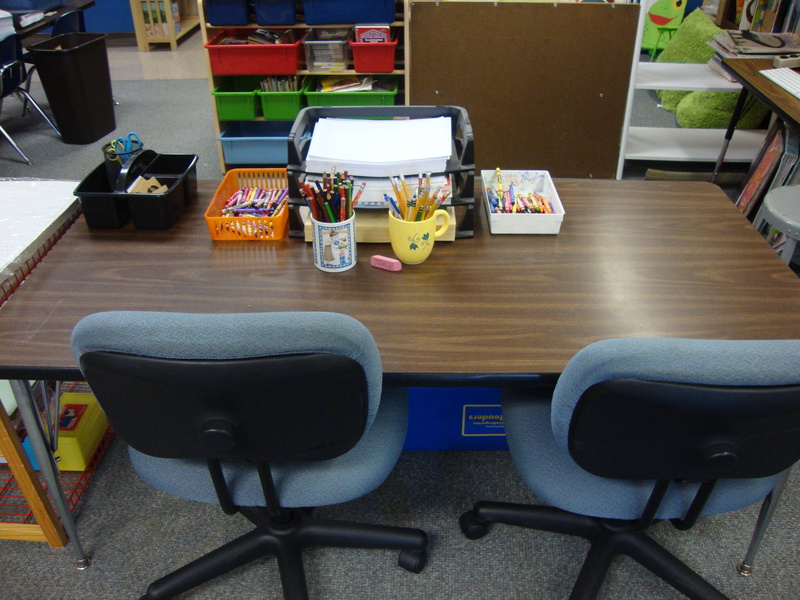 They can use the inside of their desks to store their individual work materials.